Part of the beauty of the Wet Tropics World Heritage area is its biodiversity. There are 13 species of mammal found nowhere else in the world! 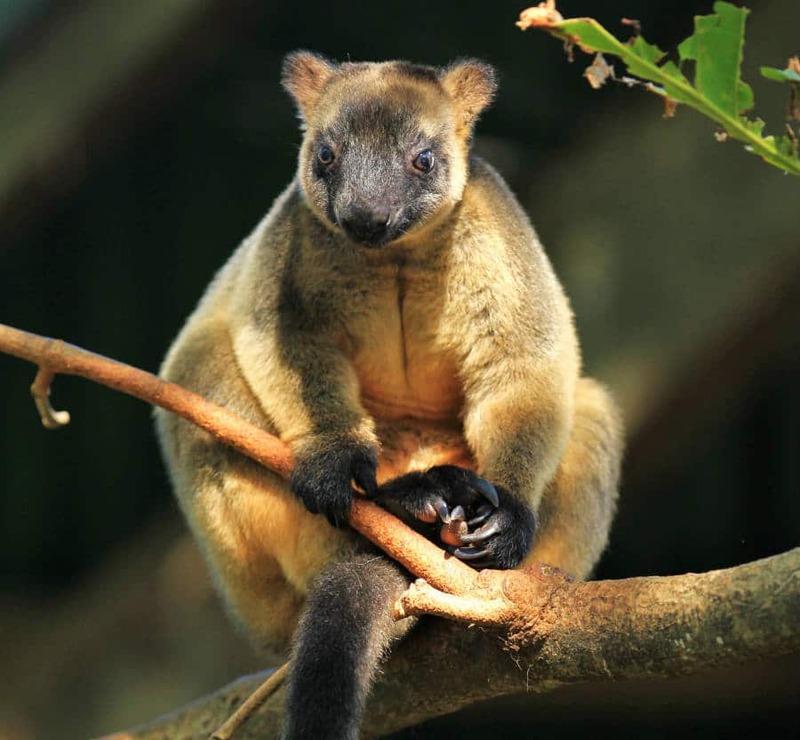 Wildlife Habitat is home to 4 of these special animals – Lumholtz’s Tree-kangaroo, Spotted-tailed Quoll, Mahogany Glider and Northern Bettong. Wildlife Habitat also has one of Queensland’s largest collections of macropods (meaning large foot), including kangaroos, wallabies, pademelons and bettongs. 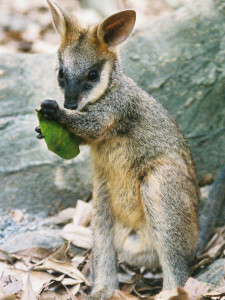 This carnivorous marsupial is the largest of its kind on the mainland. From the family Dasyuridae (meaning hairy tail) these spotted predators are in the same family as the Tasmanian Devil. 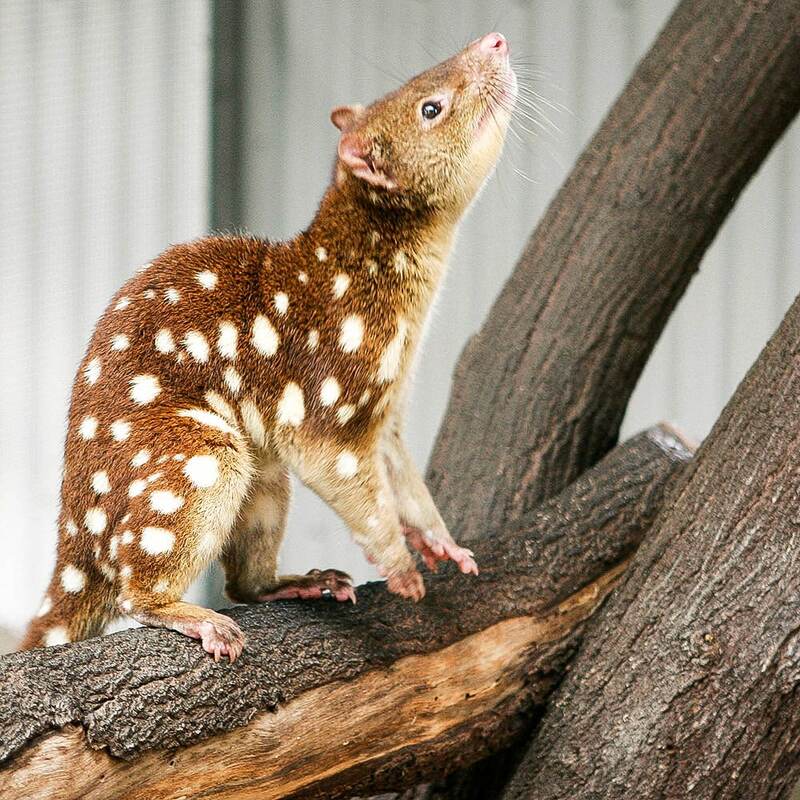 Fearless hunters, Quolls will often pursue quite large prey items utilising needle-like nonretractable claws, incredible agility and very sharp teeth in a jaw that opens very wide. They are also happy to consume carrion, insects, fish and eggs. 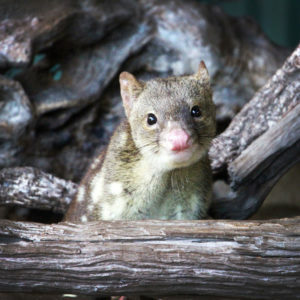 Quolls are often the victim of feral animal attacks, cars, baiting, secondary poisoning and poisoning in the first instance from eating the introduced and toxic Cane Toad.Of the four native Quoll species in Australia, the Spotted Tail Quoll is the largest and is the only representative with spots all the way to the end of its tail. Wildlife Habitat has one of Queenslands largest ranges of Macropodidae species including Eastern Grey Kangaroo, Agile Wallaby, Swamp Wallaby, Parma Wallaby, Northern Nail-tail wallaby, Red-legged Pademelon, and Red-necked Pademelon. Similar species of a different family include the Northern Bettong and Rufous Bettong. Kangaroos and wallabies cover much of Australia in distribution. Due to the diversity of species there is general similarites between each including the body shape which exhibits strongly developed hind limbs and smaller forelimbs and upper body, a long tail, and prominent ears. Although most of this family hop, not all use this method of locomotion including the tree kangaroo which has the ability to move both bipedally and quadrapedially. The mahogany glider is cryptic, elusive and virtually silent (Van Dyck 1995). 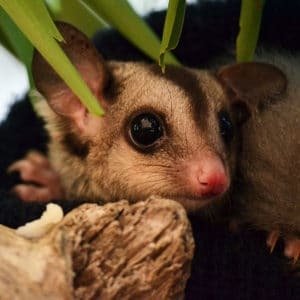 The geographic range of the mahogany glider is limited to an area of coastal lowland forest in the Cardwell – Tully region – a range of about 120km. The 100km east-west range extends from the coast to the lower Herbert Gorge and foothills of the Mt Fox section of Girringun National Park in the Wet Tropics Bioregion. Clearing, mainly for sugar cane, has greatly reduced and severely fragmented available habitat to 20 percent. Weighing only 350g these gliders depend on tropical plants, acacias, eucalypts and grass trees for their nectar and sap and will also eat insects and their larvae. 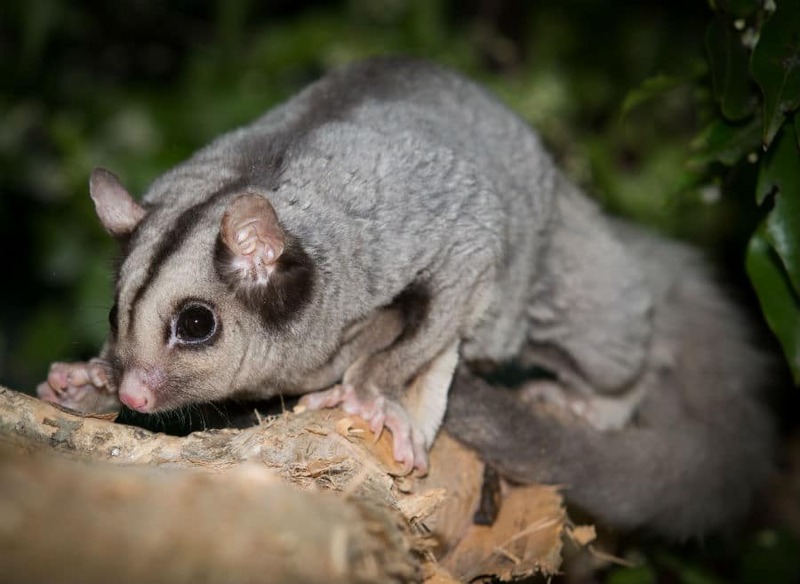 These gliding possums require a home range of up to 20 hectares in their natural habitat. Wildlife Habitat is working with Zoo Aquarium Associate with a population management program to ensure this species maintains a secure population within captivity. The Lumholtz’s tree-kangaroo is the smallest of the tree kangaroo species, but one of the largest of the arboreal mammals in Australia. This arboreal species spends most of its life in the canopy of the Australian rainforest foraging on leaves, fruits and flowers. Their muscular and powerful forelimbs and broad hind feet allow them to move in both a quadrupedal and bipedal motion. They have a long tail in comparison to their body size which they mainly use for balance and is not prehensile. Their hind feet are also much less elongated than their kangaroo relatives, having become shorter and more broad creating a greater surface area for improved grip in the trees. Although not commonly sighted the Lumholtz’s tree-kangaroo is listed as least concern under the Nature Conservation Act, due to much of its habitat being protected within the Wet Tropics World Heritage area. Wildlife Habitat is one of only 2 zoos in the world that house and breed the species. Australia’s most recognisable icon is a species that is is known for its cute and cuddly appearance. This arboreal marsupial is found in pockets from North Queensland through to Victoria. In the north the species is very difficult to find and is quite sparse, living mainly along rivers and creeks in the dry savannah country and Eucalypt woodlands. Koalas are aptly adapted to the treetops with their muscular forearms and hind legs and long strong nails for purchase on branches. They even possess two thumbs on their forelimbs and a nail-less thumb on their hindlimbs for extra grip. Koalas are known to eat many different Eucalypt species and will consume around 500gms per day depending on the size of the animal. 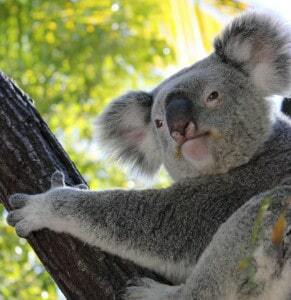 Wildlife Habitat feeds 12 different species of Eucalypt whilst in some parts wild koalas may only have a home range that has one or 2 different species. 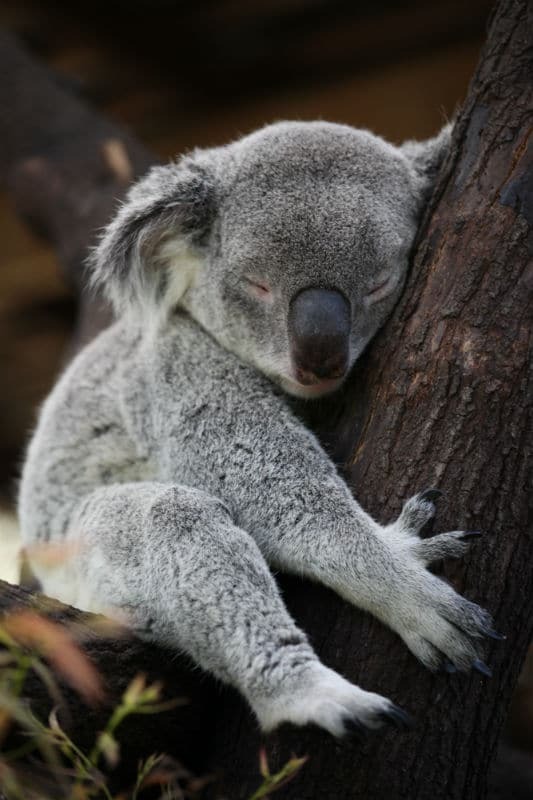 With the ability to position themselves into nooks and forks of trees they are able to rest easily for between 18 and 20 hours.